Starvation mode is a term that gets thrown around loosely. Many people believe that too little protein or too few of calories in a day will cause loss of muscle mass. 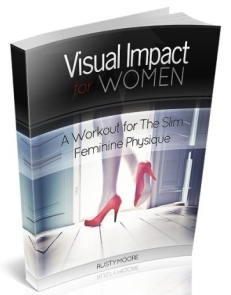 What if I told you that it is extremely difficult to go into starvation mode until you get down to 5% body fat(10% for women)? 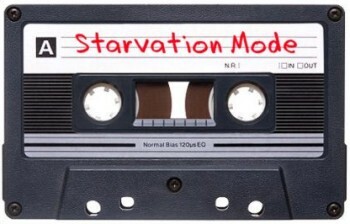 Brad Pilon and John Barban have given me permission to give you access to the first 15 minutes of one of their paid recordings: “Starvation Mode”. Brad and John discuss surprising findings of a military study, where they purposely tried to get the soldiers to lose muscle and get into starvation mode. They found it took extreme conditions to reach this point. Brad and John Show You How to Get Into Starvation Mode? These guys take an interesting approach. They show you exactly what it takes to reach starvation mode. By showing how difficult it is to reach starvation mode, they destroy a lot of muscle loss myths. All of this is covered in the recording, but I wanted to put some of this in text as well. You can also right click and save this recording and listen on your computer or iPod. I’ll post my notes below like I typically format my blog posts. Why Are Brad and John Examining a Military Study? Brad and John mainly look at a military experiment done by Karl Friedl. They point out that the military has less restrictions and can push people much harder than they can in a typical university study. There is no way this stuff would get approved by a university, but no problem for the military. In their words…To find limits to what the body is capable of, you need to dip into military research. Karl Friedl used fit and athletic soldiers with an average body fat of 14%. This is what John Barban calls “4 pack lean”. There were guys as low as 6% body fat and as high as 18% body fat. Think along the lines of a fit and muscular soldier to get an idea of the participants of this study. Karl Pretty Much Tortured These Guys for 8+ Weeks! Karl had these guys eat between 1,000-1,200 calories…but burn upwards of 6,000 calories per day with crazy activity levels and sleep deprivation. So deficits in the 3,000-4,000 range on some days. Average deficit was 1,200 calories per day. They trained like mad and also went through extreme sleep deprivation. Note: Adonis Index refers to the shoulder circumference divided by the waist circumference. As an example, my shoulder measurement is 50 inches and my waist is 33 inches. If I divide my shoulder by my waist I get 1.51. The ideal Adonis Index is 1.61. The video below explains why a 1.61 ratio is pleasing to the eye in not just body proportions…but in art, architecture, etc. The important thing to remember in this study was that they were trying their best to beat these guys down. They weren’t doing things that normal people would do while dieting, like proper resistance training. Here are some of the tactics they used to try to get into starvation mode. At around the 8 week mark a lot of guys who were in the 5%-6% range could not drop any more body fat. This is when they began to lose lean muscle. The guys who started out the leanest, reached their limits at week 6. These were the guys who lost the most amount of lean body mass. They lost muscle because they were still having days where they were running at a 3,000 calorie deficit. Once someone reaches their lower limits of body fat percentage it makes sense to eat close to maintenance levels. This strong calorie deficit at this low body fat level also caused extreme hormone disruptions: Testosterone dropped, thyroid issues, mood changes “starvation mode”. People with more fat available to oxidize…can oxidize more body fat per minute. The less body fat you have, the less you can oxidize per minute. So as you get closer to your lower limits of body fat, the slower you will burn what body fat you have. This is why those last 4-5 pounds come off slowly, NOT because you are wrecking your metabolism with an aggressive diet. Most likely, starvation mode isn’t happening to anybody reading this. The average person thinks starvation mode happens between meals. It isn’t about not having enough calories. It isn’t about not having enough protein. 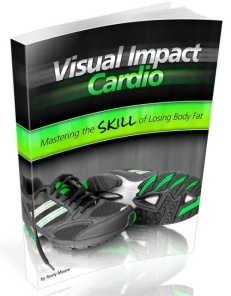 It only effects people at their critical low body fat mass. You have to be in a massive deficit and already at your critical low body fat level. You are “6 pack ripped” before ever getting to starvation mode. This is really awesome information! I’m so happy Brad and John let you share it with us. I must admit there were a lot of times that I thought I was in starvation mode, especially during my Visual Impact Phase 1 challenge. This study has definitely given me some piece of mind. …held me back from optimal results. But after reading this I’m starting to realize that maybe I was wrong. Rusty, were there any detailed notes on sleep deprivation? What effect did it have on soldiers in terms of muscle loss, if any? However, I’m in a tough place right now. I’m 19, 6 ft 1 and about 179lbs now. I realise that to get a good physique, I still need to gain more muscle, as I have only been weight training for 1 year. However, I need to cut fat also, as i have some body fat which is hiding the abs and some stored especially around the lower back. I have participated in 7 fitness contest reaching insane low levels of body fat, and not once have I lost lean mass despite that I in some instances have been pretty aggressive with the calorie deficit. If you approach your strength training the right way you will give your muscle an even stronger signal that they have no other option than to stay. Ha the old cassette tape ..very cool! So, does that mean that protein intake does not affect muscle loss? So when one is cutting, protein intake is actually irrelevant? It just shows what the body can endure. And all this time I thought two intermittent style fasts per week was a lot. Just another validation that you need to eat a lot less than you think to get lean. Love the cassette tape by the way! I really love reading your blog. The information that I find here is not written in fitness study guides. This post helped me understand so many things, because I was always paranoid as hell when I didn’t eat every 3 hours all I could think of was me loosing my hard earned muscles, because when I studied that’s pretty much what the books teach you ( if you don’t eat every 3 hours you loose muscle mass ). The stuff you are teaching here is outside the box, just like Tim Farris book ( that I also found through your site and I love it very much ). Thank you for this great site. It sounds like these soldiers had it pretty hard for those couple months. For the average person, starvation mode is probably something one would not have to worry about. You can keep your muscles while getting down to that 5-6% body fat range, but as the study found, if a severe caloric deficit is continued, the risk of withering the lean body muscle is greatly increased. Good points all the way around, Rusty, and thanks for sharing. Interesting recording. Starvation mode is always something you hear about. When people throw these terms around what they don’t realize is that most people today are very overweight. The game changes when you have lots of body fat. Starvation mode is to protect us. If you have extra weight on you then there is no need to go into starvation mode because your body has lots of extra fuel. Enough to last a lot more than a few meals or even a couple of days. This is really useful info, and good to know next time I get paranoid that I’ll become too skinny or lose muscle. From what I understand, it is near impossible to lose too much muscle if proper exercise is involved. I do have two questions though: 1) What type of exercises were these soldiers doing? Were they resistance training or mainly running around? 2) What was the macronutrient breakdown of their calories? Awesome post, Rusty…I spent years paranoid that if I didn’t eat every 3 hours on the dot, I’d lose that hard-earned muscle. Can’t believe I bought into all that marketing hype! This is great info. I would say it gives us more than just a reality check about starvation mode or protien guilt. Those are just the important ones for Brad and John to highlight. I think there is at least one other misplaced guilt that this study sheds light on – ‘resistance training guilt’. It seems to me that the idea that we need to treat our resistance training regime as the ‘insurance policy’ to accompany a weekly calorie deficit is really only a major issue when reaching body fat levels of well below 10% – more like 6%. That’s how I read these results. That’s quite important and a bit of a shake-up in thinking. It means for example that while dropping body fat we can use our weights sessions to work on those areas of our physique that we think will give the greatest pay-off, rather than weight training to stave off the Catabolism Monster! In my case (and I’ve just reached an AI of 1.4 from a 1.25 starting point in June), I can have no guilt about focusing more on specialization exercises rather than the ‘big four’ compound lifts, if that’s what is more amenable to tweaking what nature has given me. I can even emphasise fat-burning exercise ahead of muscle-building, and it won’t be a big deal until my fat stores get to crazy low levels. On the other hand, if my weight training was my ‘essential insurance policy’ while trying to close in on a sub 10% bodyfat goal, I’ll probably be antsy about being on a full mass-building program for every muscle group the whole time. When I start dieting and cutting down pretty hard, why do I start losing strength then? My doctor thought I was at about 7% body fat, from just looking at me, but I think I could go lower. I would do my same workout and every week I would lose a rep or so off of what I was doing the week before. What gives? Brilliant research. It also makes dieting a little easier to stick to once you relaise that, if honest with yourself, you’re body’s not going to go into “starvation” mode while you sleep if you skip that midnight Casein Protein shake! The only benefit I can see to eating regular meals is that it’s easier to stick to good foods at the next meal. I’d like to know what happened to these guy’s body fat levels after they went back to a normal routine,.i.e. resting Blood glucose levels, BF, Blood Pressure and lean mass. It’s concievable their muscle mass went up? 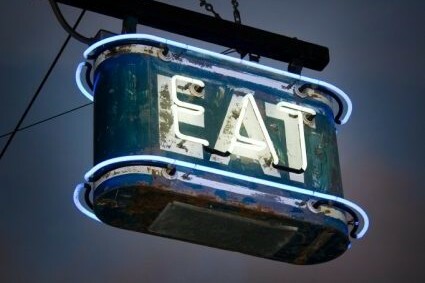 Great post Rusty – As a keen fan of Eat Stop Eat and IF, I do give my body a break from food every month or so and always feel better for it. I do not really concern myself over the science of it all because it is not a major part of my life. No need to get too hooked up about starvation beacuse as you say so many of us aren’t even in this category. People sometimes argue that fasting will damage your body but they haven’t done the same kind of reasearch that Brad et al have done…our bodies are sensitive machines and will surely let us know if something needs to change. Keep it simple and varied – that’s my approach. This will take a HUGE weight off off many folks’ mental shoulders. I think another reason for a lot of confusion is that most all this muscle-loss info/myth comes from the fitness industry. Commercial interests aside, the main thing really is that a 240 pound lean bodybuilder will lose muscle mass much more readily than someone with a natural, good level of lean mass. Simply because the body doesn’t need nor want this excess weight (goes for both excess fat as well as excess muscle). So that excess drops fast and easy. I mean, heck: they stop using gear and they lose mass right away, never mind calorie deficits etc. Just like a clinically obese person drops weight super fast initially. Same difference. But a good lean, functional physique will stick with you all the way, as you once again pointed out: this is honestly reassuring man! I’m going to extreme leanness levels now and this is really good to know that there’s absolutely nothing to worry about as long as I keep up some weights and stay close to maintenance once there. 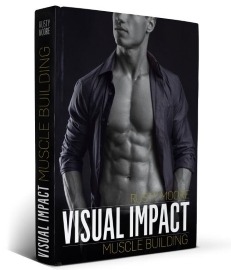 Rusty, you have done much to change my ideas about lean muscle growth… actually, most of what you and Pilon /Barban talk about is very similar to what I naturally did back when I was a lean 190 lbs. As an experiment I ballooned up to 250 and became a pro strongman, but now that I’m working my way back I have had to re-brainwash myself back towards the direction where guys like you stand. Great article! These mainstream fear tactics against not eating every 2 hours are lookin’ pretty stupid. I love your website!! I’ve read almost all the articles and thank God, you actually make sense & have some logic. Most of the mainstream stuff make no sense at all but for those who aren’t very educated about the science behind the human body can be kind of frightening even if they do seem to go against logic. Thank you so much for being no-nonsense, I really appreciate all the work you’ve done! Your clarifications have made my life much, much simpler (because now everything is coming together)! I just noticed that you have 10,000 people that like your Facebook page. That’s impressive! With that many fans, you should be making videos and posting them to YouTube and then sharing each video on Facebook. Heck, you could eventually start making money on YouTube by posting videos, especially with the fan base that you already have. I hear similar things like that from professionals, though as far as weightlifting goes (seriously though, they know what they’re talking about when it comes to lifting more, but I’m not sure about their knowledge on diet as far as muscle loss goes). Great to see there’s even more information out there than I’d first thought to help put this whole ‘starvation mode’ fiasco to rest. The human body is too clever to allow itself to lose muscle when it needs it for survival. This is an area the Lyle Mcdonald has addressed in his “stubborn fat protocol”. Do a web search search on it. Rusty: Thanks for this post. I am one who might well have been overly afraid of this issue. When you get to a very low body fat is that your body wants to hold on to the last bit of fat or that what fat there is can’t be oxidised fast enough? I wonder if the above level of body fat is individual ie the point at which your body holds on to the fat can be higher in some? Great info! Just thought I’d mention something about the claimed ideal ratio of 1.61, as backed up by the video. While it may be correct that people do find a ratio of 1.61 to be quite pleasing, because our ratio is measured in shoulder and waist CIRCUMFERENCES, the resulting ratio of the visible shoulder width to waist width is not necessarily the same. For example, my waist circumference is 31″, and shoulder 46″, giving a ration of 1.48. BUT, the visible width of my waist (meaning what people see from the front) is only 14″, and the visible width of my shoulders 18″, giving a ratio of only 1.28 – a big difference. So, for people to have a visible shoulder to waist ratio of 1.61, the difference between their shoulders and waists would have to be quite large – almost unachievably so, I think. Although a lot of us already know this…but mainstream fitness still doesn’t have a clue. This was a great supplement to Brad Pilon’s and John Barban’s work. Rusty, thanks for more info! Very interesting article. Note to self, check out military studies on weight gain/starvation in the future. But I do agree with Leo’s comment. The 1.61 ratio seems sort of skewed to me. I’m going to put together photos for comparison to figure out if this truly is most appealing. a ratio of 52 inches/shoulders, 32 inch waist seems a bit extreme for a height of 6 feet. I’m a girl and don’t know if I find guys most attractive at that shape. Another fat loss myth busted! If a guy wants to go from 20% body fat to single digit with diet and IF, should they switch phases in VI and start with phase II to spike GH and weight loss then go back to phase I when they can eat more to support the growth stage? I hope this article gains plenty of traction because this is one of the most misunderstood notions in health and fitness. Once I started fasting and restricting calories, I lost no muscle, only fat. I also feel more energetic and less sluggish throughout the day. I love hearing this…but it would also be good to know if there was evidence for the reverse. Are people just repeating what they’ve heard and there’s no evidence whatsoever? Often there is *some* reason for why people say muscle gets lost. In one of Brad Pilon’s other audios associated with Eat Stop Eat, he noted some studies showing excessively overweight people did lose some lean mass when placed on a really restrictive daily caloric intake. But the researchers in one of the studies made the rather important observation that a fair bit of that observed lean mass decline has to relate to the shrinking of the gastro-intestinal tract, as the person goes from obese to a more normal body weight. That counts as a loss in lean mass even though we don’t tend to think of that when we talk about ‘muscle’. This is pretty interesting, especially since when people are worried about starvation mode, especially in others as they try to diet. It is just another worry that is exploited by the food industry. I’ve been following Brad for a while and also Martin of lean gains and much of what they talk about is based on science…which is why I like their stuff. I am finding it harder and harder to deal with these magazines which tell people to eat every three hours and take massive amounts of supplements to avoid starvation mode. I really wish more people would look into the science of things instead of believing what they see and hear from so called experts! Awesome article Rusty. I hope everyone reads this article. The one thing I hate the most is when people say “OMG I’m starving, I haven’t eaten in 4 hours.” That really makes me go crazy sometimes haha. Starvation mode is very real! Why do you think people can survive for months even without food (not without water) and not starve to death? Because they arent eating, their body starts eating itself (muscle) for preservation. Starvation mode is very real. I cut my calories below 1600 and I lost a lot of muscle so it was harder for me to lose the weight I regained once I started “eating normal” again. This is hard. Starvation mode is very real. Its actually a gift we were given so we could go for long periods of times without food and not die. Meade, the key point is which out of the body’s various energy stores are mobilzed first when put in that state of a calorie deficit? Someone proposing that muscle is the first thing which gets broken down needs to provide studies showing this, because research like the study being discussed is indicating in all but the super-lean, it is body fat that drops in preference to muscle. There’s also a complicating factor that muscles can lose a bit of their volume when we keep them deprived of glycogen through persistent hard dieting or eleminating carbohydrates. @Meade – the point is that it is real, but not something the normal, everyday person is going to ever experience from not eating breakfast, skipping a meal, or fasting like the mainstream fitness dogma presents. As for the AI Ratio, having been a member of AI since early last year, reachign 1.61 is possible, yet it can be difficult if one has much muscle to gain. I’ve watched I dont know how many guys come thru the program and hit 1.6 and talk about how their lives have changed after hitting 1.5. I hit 1.7 at one point last year. It is very much possible and if you don’t believe it, go check out the contest winners on their blog. @meade: i think the research makes fairly clear (and sense, i believe) that you need to be at the extreme end of body fat levels and be in a continous state of significant and constant caloric deficit for starvation mode to occur, ie for the body to start drawing energy from muscle tissue and, at the very final stage, from the organs, to survive. however, in your defence, some muscle loss is inevitable, because the one question the research doesn’t consider is how much muscle the body actually needs at the stage they were at with their research? if you’re at 225lbs with 5% body fat, then as sure as night follows day you will lose some muscle mass, as there simply is no call for that much mass to be lugged around ….. and i guess it gives rise to the bigger question: how much muscle do we really need? i dunno, would be keen to hear other opinions on this matter. great post & provides lots to think about, that’s what matters. Good info to keep handy, I set some fat loss goals about a month ago and actually convinced myself I wasn’t eating enough and was losing muscle when I was probably at most running with a 1k calorie deficit. I’m looking to get a six pack for the first time in nearly 20 years but I have been pre-occupied with the notion that I might lose muscle while cutting. I think muscle loss can occur when eating 1600 like maeda said. However many factors come into play. I believe the body can tell what the useless body mass is. If you are built like a bodybuilder and you stop working out when cutting calories, your body will say “oh this is not needed”. On the other hand if you are obese your body will eat through the massive amounts of fat. Like this article indicates if your 5% fat and in the military you probably have more lean tissue, so your body will probably consume muscle in a calorie deficit. Moreover protein is necessary so if your not getting any… then your body will break down your muscle to some level. How much do you need? I don’t know. But if protein is consumed when in a massive deficit, it should probably be consumed before a state of rest when the body is not going to use it for energy. What is important about this article and Rusty’s site is that he points out that we really should be lean. But we think we need to eat so much or we will be unhealthy. How many fat people do we know who need to eat five times a day so that they can get lean? The reality is most people should be eating 2000 calories or less a day in this world to maintain a real healthy weight. By the way I ate 1500 calories a day for five months and my muscle looked more impressive due to the fact that it had 60 lbs less fat covering it. Interesting post; it certainly confirmed what I have always suspected about the “starvation mode” scare. BTW, the recording ended mid-stream as they were talking about the significance of neck circumference. Would love to know what that was. While this information is great. I believe there is a different level of “starvation mode” that can be detrimental to many dieters efforts. It is fairly easy for your body to think it ay not get enough food and therefore put the brakes on efficiently processing the nutrients. In other words it will make getting rid of the calories consumed much more difficult as well as requiring much more activation energy to get up and running again. For many people in decent shape this is not a concern. I agree with being very difficult for your body to eat muscle due to starvation mode. But for the beginning dieter it is vital to keep a constant stream of calories entering the system. After all it is used to getting plenty of food and your body will get scared if something radical is happening. Radical in this sense could be not getting a fresh supply of calories every few hours. The more I think about it, the more I realize what an amazing mechanism our bodies really have regarding energy supply and consumption. I mean the one thing you might want to watch out for is adequate protein supply –and even for that you seem to have a 48-hour window!– but as far as calories? You really simply don’t need to worry about eating at all. It’s actually quite a funny idea to eat every couple of hours, like some hospital patient hooked to a life support system opr something. I guess our bodies are a little smarter –and more efficient– than all that. First time I’ve come across this, I guess there’s a paradigm that revolves around the fitness industry and few people challenge it. I’ve been in China for the past several years and found that the Chinese have a much different perspective on fitness and health. They have one of the healthiest nations, in fact there was a bestseller written about Chinese health and fitness. Anyways a little off topic, but I like that you challenge the norm. This is a very interesting article because it features a real experiment on what starvation brings about. It made me realize that doing any weight-loss method excessively will only bring harm to my body. Thank you for posting this. I have been doing insanity workout (I dont know if you have heard of it) and this is my second time doing it and I am into week 4. I started thinking I was going in to starvation mode because I was doing the training 2 times a day and resistance training in addition every other day. I don’t know if its my imagination but it seems like my belly has gotten bigger which is very strange because the last few weeks I have been so busy with school and training and work I have had hardly any time to eat and when i do it its all healthy. (I’m also a vegan). If I’m not in starvation mode can you give me an idea of what might be happening? any info you could give me would be great. I have quite a bit of body fat (230 lbs and 25%) to be exact. What has ruined my metabolism is from years of trying to starve myself. Now I find it near impossible to lose weight. I try everything. I just stay the same. Maybe starvation mode isnt true for some people, but it is true for others. And not extreme cases, either. If you restrict calories below say 1600 (if you are male), then over time your body will start getting better at storing fat. It will be harder for you to lose weight because it wants to hold on to fat , believing you are in a famine. This is why my metabolism is basically ruined. Im not talking about skipping a few meals every now and then. Im talking about what most dieters try to do , which is severe calorie restriction. Thank you for this article! It is one of the very few that truly reflects what starvation mode is and why the vast majority of people will never have to worry about it! Great post; very reassuring. I started doing intermittent fasting a few weeks ago, having been convinced of its many health benefits. But this further convinces me that there should not be any negative effects. Yes; I agree with that Meade. Intermittent fasting and short term calorie restriction are no problem, but restricting calories too much for months on end will certainly slow down your metabolism. Though I believe there are ways to increase it again – HIIT and a nutrient dense diet for instance. Those are some interesting findings. This clashes with my research that shows a shift in several different hormones when calories are restricted for an extended amount of time. I’ll have to look into it further. Great post there! Just to echo the other commenters thoughts – this pretty much flies in the face of conventional thinking! I’m cutting at the moment so am severely restricting calories – hitting 1800 per day to be exact. Still, what the article didn’t mention is the fact that protein intake still needs to be adequate. Daily protein requirements will still need to come from somewhere – so sub 10% bf or not, you won’t get away without consuming the right macro nutrients. Recentely discovered the site and love it. Enjoyed the initial abs blueprint videos. There was a graph in the video on eating that talked about Eat Stop Eat and Pilon’s method. The graph was free fatty acid levels while fasting. It seems to say adapted from Klein et al 1998 or 1993. Anybody know where I can get a copy of that graphic or graph?? Or maybe where to get a copy of that research study? Thanks! It made me realize that doing any weight-loss method excessively will only bring harm to my body. Thank you for posting this. Thanks for the info! This definitely made me consider how much I am putting in my body. I’m trying to track my eating, so I stay healthy and eat when I need to. Even if I am on the go and busy. Thanks for the article guys!!! My acupuncturist recommended fasting… I have NEVER had more energy in my life as a result!! And my body is definitely not starving!!! This article is very interesting. I have to admit I am just a little tiny bit skeptical… I am a 34 year old female trying to get my body back in shape. I am about 28% body fat… yeah I am a little chubby. I have been on a very low calorie diet for the last 6 weeks (first 3 weeks only consuming 500 calories a day, didn’t have the energy to workout, the last 3 weeks increased intake to about 700-800 a day with moderate cardio) … lost about 20 pounds so far… the first week was awful, i was so hungry had no energy felt like crap. Lost 10 pounds but i know a lot of that was water. In the last 2 weeks I have been stalling but have not felt hungry whatsoever even on 600 calorie days. I was starting to wonder if my body was going into “starvation mode” and that my metabolism had adjusted to my low caloric intake. I am now considering increasing my calories up to 800-1000 and skipping cardio and just weight training. I was worried that I am losing muscle mass which is going to just hurt me in the long run and I will end up fatter than before. Anyone have any ideas for me? I am eating clean, mostly just eating lean proteins, small amount of high fiber carbs and fruit and veggies. I would like to break through this plateau and do what will serve me best in the long run. If it were possible to just starve yourself for long periods of time and not lose muscle mass till you got to 5% body fat everyone would just stop eating go on the elliptical an hour a day and eventually get six pack abs. Obviously that doesn’t happen – you just end up looking skinny-fat and become a twig that can’t lift 5lb dumbbells if you do that. And I have personally dieted badly by over-restricting calories combined with large amounts of exercise – I lost 52 lb of weight but 8lb of it was muscle. I went from 30%fat@240lb to 14%@185lb – so nowhere near sub-10% body fat and my training and diet was nowhere near as extreme as this. I think IF can be used in a smart way in short 24 hour periods as long as it doesn’t create an overly large calorie deficit – Intermittent Fasting is completely different ball game from Extended fasting with respect to muscle loss though – Just my 2c ! Is there anyway I could read a copy of this military study ? I knew it! How else could you explain all these “crazy” celeb dieting and getting in shape in no time!? I remember how I traveled to Europe with just the right amount of money to eat a little during the day. I had to carry my heavy baggage with a bunch of clothes all around Vienna, Paris; running -with my baggage- to catch the train, the plane, etc. After only 3 weeks, what I had been trying to get in the gym happened: 6 pack abs. No proper workout, no ab crunches, no nothing. I just stopped eating so much. Obviously I’m a skinny guy so I didn’t have to shed a lot of fat. Starvation mode is a stupid myth created by companies which want to sell you useless supplements. Our ancestors didn’t eat every three hours and most of them were probably looking better than most bodybuilders and fitness experts. Check Martin Berkhan’s blog “Leangains” to educate yourself. 4)Have one refeed per day, eating at maintenance level of calories. After already losing 50 pounds due to a prior sickness, I did a 40 day fast, only consuming water. I could tell when my body entered true “starvation mode”, as I could smell my body consuming my muscle mass to stay alive. <- If this has happened to you – and you can't NOT notice the stench – then, yes, you've entered starvation mode. Starvation mode is horrible. You feel cold all the time, become constipated, dizzy, depressed and have little energy. I’ve restricted my calories and over trained. 1500kCal with running a couple of miles per day and doing 3 hours intensive martial arts 3 times per week. I lost fat and a lot of muscle and became underweight very quickly. I had to stop exercising after becoming injured and frightened of weight gain I cut to 1000kCal. I had anorexia nervosa and was unaware of it until I became too ill to work and my doctor referred me to a psychiatrist. At the start of my eating disorder I was 29 years old and I’m male which just made it more difficult to accept as it normally happens to adolescent girls. I’m now 31 and in recovery for the second time. Recovery isn’t easy and has many nasty physical and psychological side effects. After loosing >25% of your body weight (I was a healthy weight at the start!) it becomes impossible to eat normally. At the start, eating more than 1000 was hard work, then when I managed to get to 2500kCal, I ended up binging lots and would sometimes vomit which is what often causes bulimia. Lucky that didn’t happen. After relapsing for a few months I just sucked it up and binged on well over 6000kCal per day to get better. Diet safely, please don’t put yourself on a starvation diet. The problem is it’s often too late as one of the symptoms of starvation is body dysmporphic disorder so you fail to see the weight coming off until it’s too late. Previous post: The 30-30 HIIT Cardio Workout. A Great “Go-to” HIIT Workout. Next post: One Exercise Per Muscle Group?